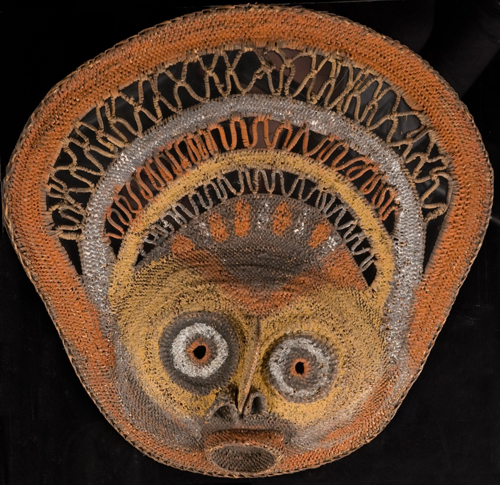 Abelam yam masks were never worn by humans. They are so small because they were made to adorn the long yams grown by the Abelam people of Papua New Guinea. These long yams, which were not eaten, grow up to 6-9 feet and were exchanged between men as a form of community building. An Abelam man's prestige was measured in direct proportion to the size of his yams. Special long yams with anthropomorphic features were considered living supernatural beings and were lavishly decorated with paint, feathers, shells, leaves, and masks, and then publicly displayed. The interlacing between solid bands refers to the caterpillar found on yam vines.